A pre-shot routine can help eliminate distractions. From young to old, people of all ages play golf. Some of them begin swinging a club long before they can ever play a round, while others do not start playing the game until after they are retired and are looking for a way to spend their time. Still other golfers play the game for a living, raking in thousands or millions of dollars for their efforts. The following tips will help golfers of any skill level. Professional golfers can make the game look simple, their motions effortless as they place the golf ball exactly where they want it to go. While such golfers have obvious skill, preparation and practice are still the keys to their performance. To play better golf, it is important to go to the driving range and hit practice balls, beginning with a wedge and working your way up to a driver. 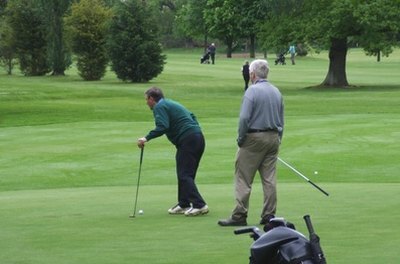 Then head to the putting green and make a few short putts before moving out and putting from longer distances. When you're playing a round, make sure to take full practice swings. Clip the grass on some of your swings to practice getting under the ball. Do not just walk up to your golf ball and swing away. Before you address the ball, you should think about a number of topics, the first being how far you want to hit the ball. Then think about whether or not there are sand traps, heavy rough or water in that area. Consider the wind direction and how hard it is blowing; then decide where the ball will go after it lands. Select your target, making sure you give yourself some room for error. Then select the proper club to accomplish your shot plan. With enough practice, you will know how far you can hit various clubs and which you hit best. There are many aspects of a golf swing that must go right for the desired outcome to be achieved. Tension in your chest or shoulders can cause your ball to go somewhere you were not intending it to go. One of the easiest ways to avoid such tension is to take a deep breath and let it out just before you swing the club. Begin the swing as soon as you exhale. A deep breath also helps some golfers clear their minds and can be an important part of the preshot routine. Variables are a part of the game of golf, but variables also are one of the reasons why golfers shoot high scores. As a result, reducing the number of variables should help reduce your score. Some variables, of course, cannot be controlled. Those include the wind and weather, the pin placement on the green and the location of the hazards. Other variables can be controlled. To reduce the variability of each swing, develop a routine for how you approach the ball and how you swing. Develop a routine for how many practice swings you take and for your breathing pattern before a shot. One of the main reasons a golfer hits low shots or shots that do not travel far is because he strikes the top of the ball with his club. This often is because as he is about to strike the ball, he jerks his head upward, usually in the direction in which his ball will fly. When he pulls his head up, his entire body follows suit. And while the upward shift may not be noticeable to the naked eye, it causes the head of the golf club to be higher. When it hits the ball, it hits the top part and places downward pressure on the ball, causing it to travel low or bounce along the ground. Many golfers have most of their problems while they are on the green. Practice is an important part of becoming a better putter, since practice helps golfers determine how hard they need to hit the ball from various distances. Reading the green is an often overlooked aspect of putting, but it should not be, since even minor fluctuations in the terrain of the green can change the direction of the ball. Stand behind the golf ball and look at the path between it and the hole. Look closely at the shape of the green and determine how its contours will affect your shot. Take them into account before striking the ball with your putter.